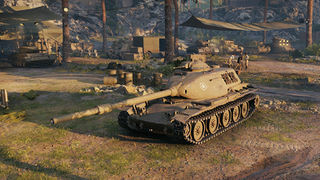 Der T95E6 ist ein amerikanischer premium mittlerer Panzer der Stufe 10. 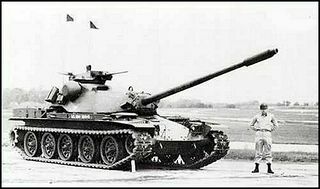 Einige Militäranalysten bewerteten die Experimentalfahrzeuge der T95-Serie als unterbewaffnet. Um die Feuerkraft des Panzers zu erhöhen sollte ein neuer, schwerer Turm namens T96 auf der Wanne platziert werden. Damit hätte die 105-mm-Kanone gegen eine 120-mm-Kanone ausgetauscht werden können. Die Entwicklung war jedoch zum Scheitern verurteilt und das Projekt wurde am 7. Juli 1960 eingestellt. Es wurde eine Attrappe gebaut. Head on, turret is fairly bouncy, with no turret cheek weakspot. By pure paper stats, the T95E6 looks like it's a very, very mediocre tank, but it actually isn't. 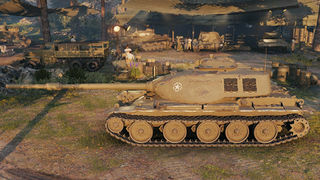 It all revolves on the excellent gun that it has, the amazing 120mm T123E6. 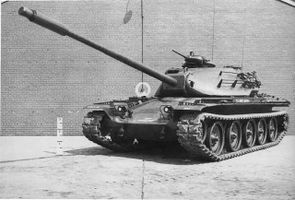 For all intents and purposes, it's the M58 on the T110E5, with a few stat changes. It trades a little better Rate of Fire for worse accuracy and aimtime, as well as about the same dispersion values. All in all, fairly good gun to build a tank around. The trouble comes with the tank, mainly in the speed. Don't expect to be going too much above 40 km/h unless you get a downhill slope. Hulldown can be viable, but be cautious of your tumor, as it sticks out a good bit before you can shoot back. 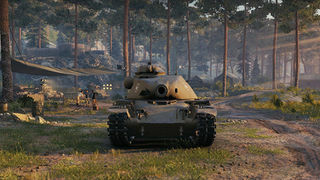 This is best played as a mid-line support tank, as the armor simply won't hold up consistently at close range, and the .4 accuracy will render all shots further than ~300m pure RNG.